i have a confession to make. i cannot make pie crust. i’ve tried a few times and each time it’s turned out horribly. i wanted to make an apple pie for thanksgiving…pie crust fail. i tried to use a “no-fail” pie crust to make some blueberry pie…that one was even worse. sigh. that’s why i’ve never tried more than a few times because it gets a little bit discouraging trying to make something that’s supposed to be as “easy as pie” and it just won’t turn out. BUT THIS! 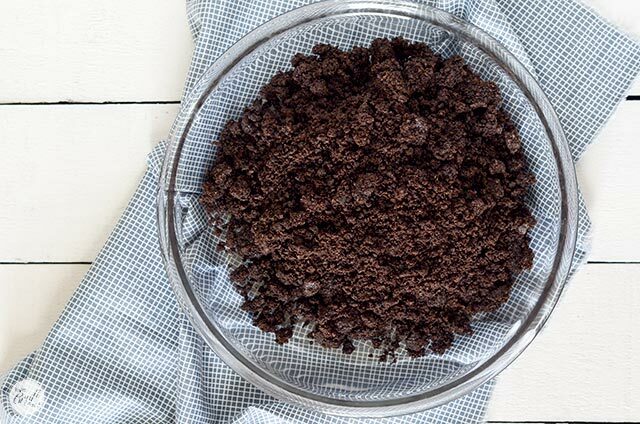 this no-bake oreo cookie pie crust is unlike the flour dough pie crust that you have to bake for your regular pies. 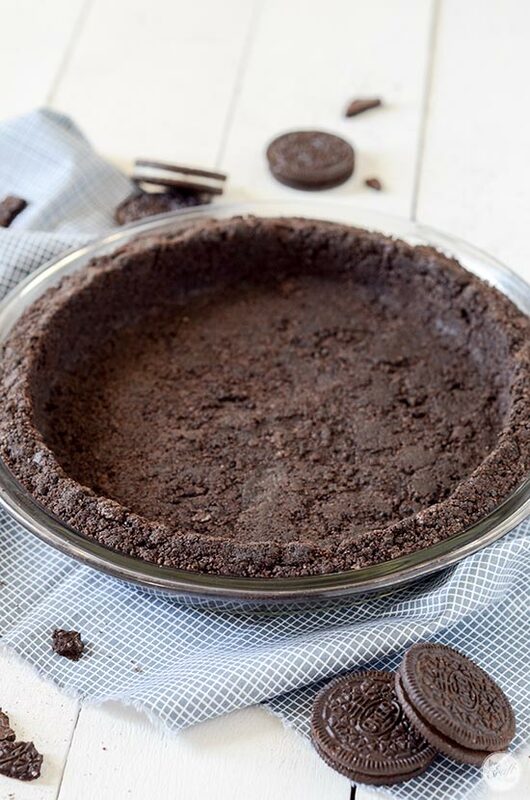 THIS oreo crust is the easiest thing you will ever make. heck, even *i* can make it! 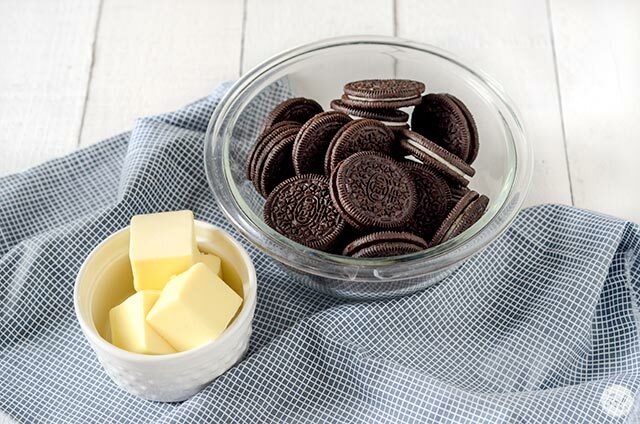 it uses only 2 ingredients: oreos and butter – it can’t be bad! it is a no-bake pie crust. you don’t even have to bake it in the oven! want to make a blonde one? just swap out the chocolate oreos for the vanilla flavor! you don’t have to roll it out into a circle or any other shape! 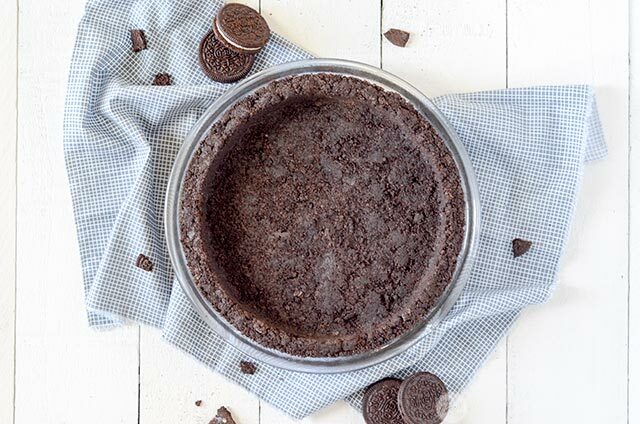 you can make lots of different desserts using an oreo cookie crust like ice box pies, chocolate mousse pie, homemade oreo ice cream cake, no bake oreo nutella cheesecake…the possibilities are endless! it’s made out of oreos. and i love oreos! enough said. so like i said above, one of this pie crust’s great qualities is that it only uses 2 ingredients :: oreo cookies and butter. 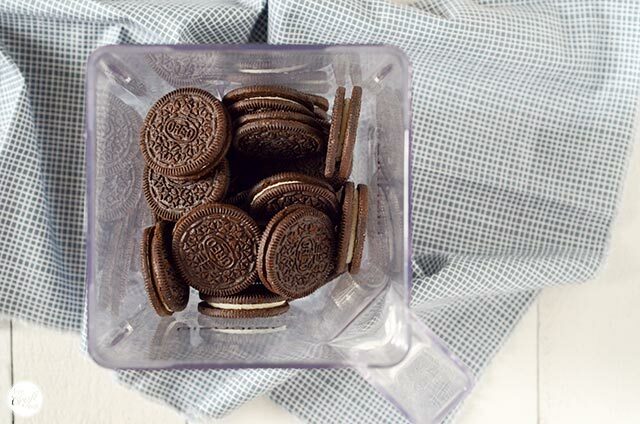 you only need 24 oreo cookies (if you buy one regular-sizes package oreos you will have more than enough), and 1/4 cup (or, half a stick) of butter. 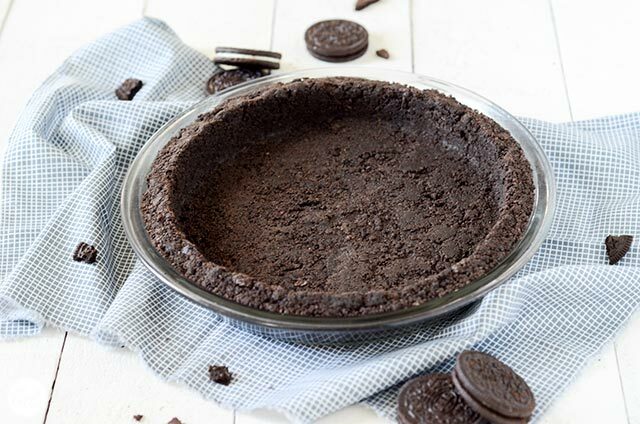 so let’s quickly walk through the steps on how to make an oreo crust. 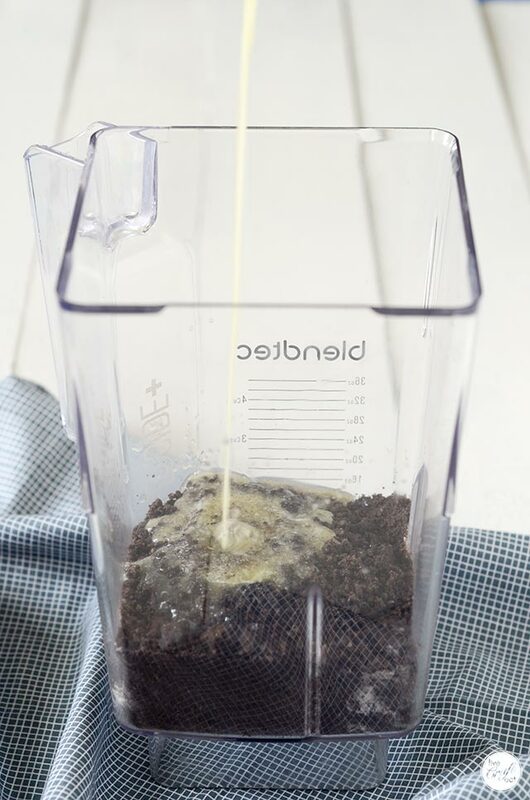 …and then pulse the butter and oreo cookie mixture until you’ve got pretty fine crumbs. …and press it down around the bottom and up through the sides of your dish. 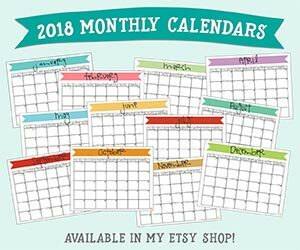 using just your fingers works really well for this job, but using a metal measuring cup (aff link) can help push it down evenly. and there you have it! you’ve just made the easiest, truly most fail-proof pie crust ever! and you know what? i’d eat this any day over the traditional baked pie crusts (you see, i don’t like those baked pie crusts anyway!). 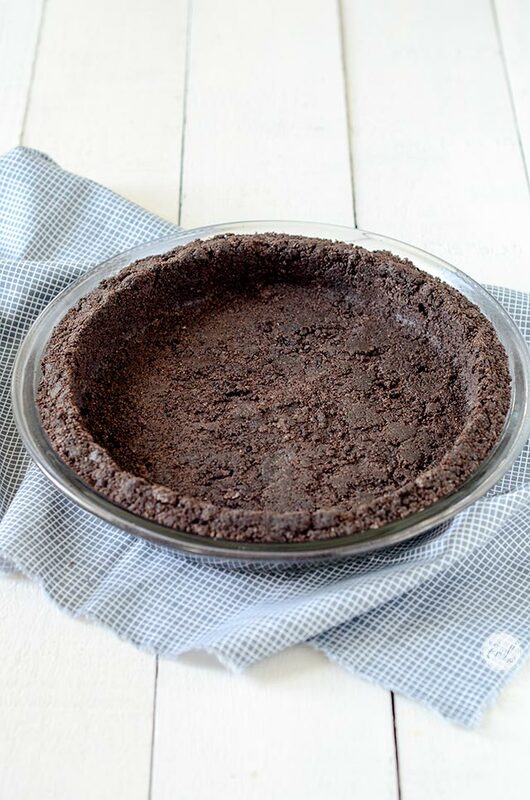 but this oreo pie crust looks ready for me to fill with some ice cream and top with hot fudge sauce. 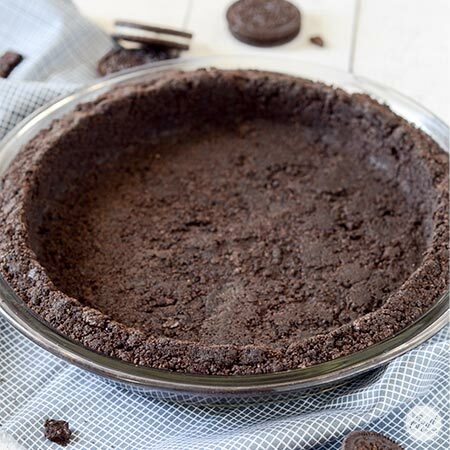 this oreo cookie pie crust recipe is so simple, delicious, and versatile, i bet you’ll be coming back to it again and again for all your chocolatey pie needs! pulse oreo cookies in a blender or food processor until crumbly. add melted butter and pulse until fine, moist crumbs appear. 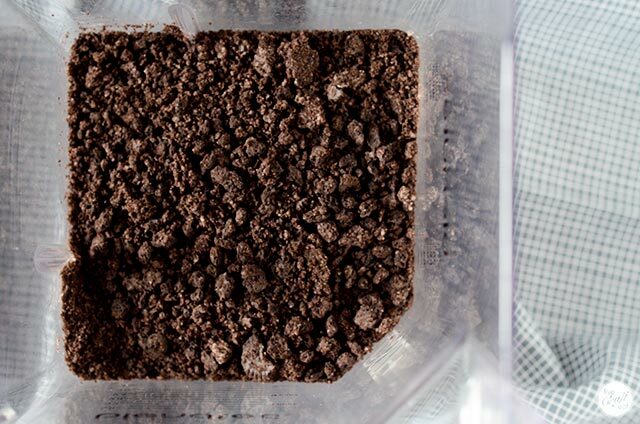 pour oreo crumbs + butter mixture onto a pie plate or other dish. press down with your fingers or a measuring cup to get an even surface on the bottom and up the sides of your dish. it's ready to fill with your favorite ice cream, or to use for whatever dessert you'd like! enjoy!